Attractive self-catering accommodation for up to 6 people. The cottage is situated in a quiet cul-de-sac in Keswick town centre, in the heart of Cumbria's stunning Lake District National Park. Holly Cottage is a traditional nineteenth century Lakeland stone house with four good-sized bedrooms. At the end of the street, there is easy access via a footbridge over the River Greta to Fitz Park, with its extensive green space and children's play area. The cottage is beautifully furnished and comprehensively equipped. It is normally let on a weekly basis, but short breaks may be available in the low season. The spacious lounge/ dining room has a cosy living flame gas fire surrounded by a polished Lakeland slate fireplace and comfortable leather sofas. For relaxing after a day's exploring there is also a digital TV with DVD player and a digital radio/ CD player together with a selection of books, games and details of local activities. The dining area benefits from a solid oak table, chairs and a dresser. The kitchen/breakfast room is fully equipped with electric oven, gas hob, dishwasher, microwave, fridge, table and chairs. Washing/drying facilities, freezer and secure storage for 2 bikes are provided in the utility room at the rear. At the front of the house, there is a patio garden with a wooden bench. The bathroom includes a shaver point and a thermostatically controlled shower above the bath. 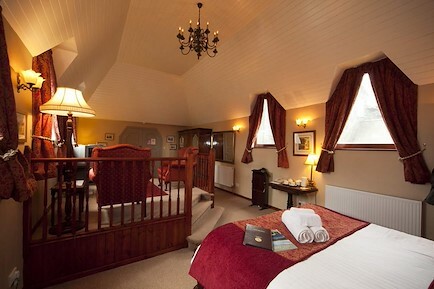 The main bedroom has pine furnishing with a king-size four-poster bed, period fireplace and fitted wardrobes. The second bedroom has a three-quarter bed, wardrobe, chest of drawers and views towards Grisedale Pike. On the second floor, the third bedroom has a double bed, pine furnishings, a fitted wardrobe and plenty of cupboard space. Also on the second floor, the fourth bedroom has pine furnishing with a single bed, a wardrobe and superb views of Skiddaw. A shower room with WC is between the two bedrooms. Your enquiry will be sent directly to Holly Cottage. Please fill in as much detail as you can.